When westerners first think of Indian cinema, their minds immediately gravitate towards several things: overwrought melodrama with a few song and dance numbers thrown in, or cartoonish and over-the-top action sequences that have proliferated YouTube. If they tip the scales toward being a cinephile, then Satyajit Ray and Raj Kapoor are definitely on their radar (or should be). However, once you get past this basic broad strokes of Indian cinema, you are presented with intelligent, thoughtful, array of films that span decades, languages, and genres. 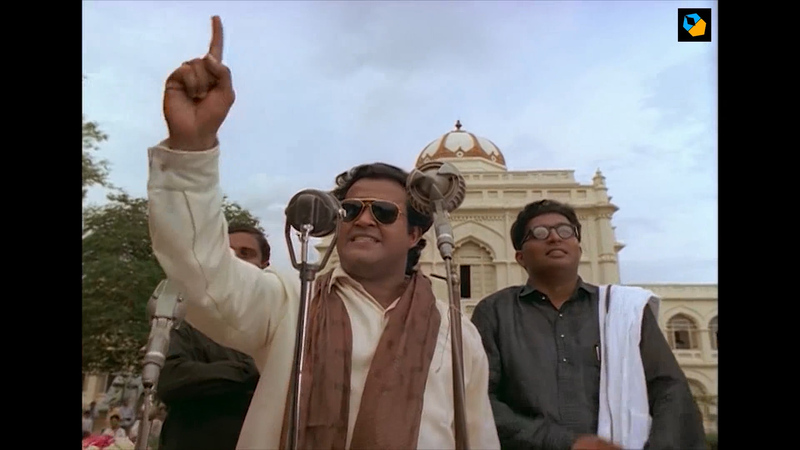 One of these movies, is Iruvar, a criminally underrated epic about the rise and fall of two men set in the backdrop of Indian (specifically Tamil) cinema and politics from the 1950s to the 1980s. On the surface, the film does have the musical numbers and melodrama that I have previously listed. Yet, it is a remarkable piece of modern filmmaking that harmoniously and seamlessly combines elements of Bollywood, the decolonisation of India, and western films. At first glance, Iruvar tips its hat to previous western classics that take a microscopic look at the hero’s journey, their friendship; and what ultimately corrupts them. The film has a similar plot structure to classics like Citizen Kane, Amadeus, or even Once Upon A Time In America. But beyond these generalizations, the film also borrows from Orson Welles’ elements of cinematography and storytelling that have become mainstays in cinema: deep focus, its use of angles, camera/ actor placements and movements to establish dominance as characters ascend to positions of power. Beyond this, it also has roots in early De Palma films since it uses formalist deconstructionism to analyze certain scenes and re-contextualize them to provide something new and wholly original. 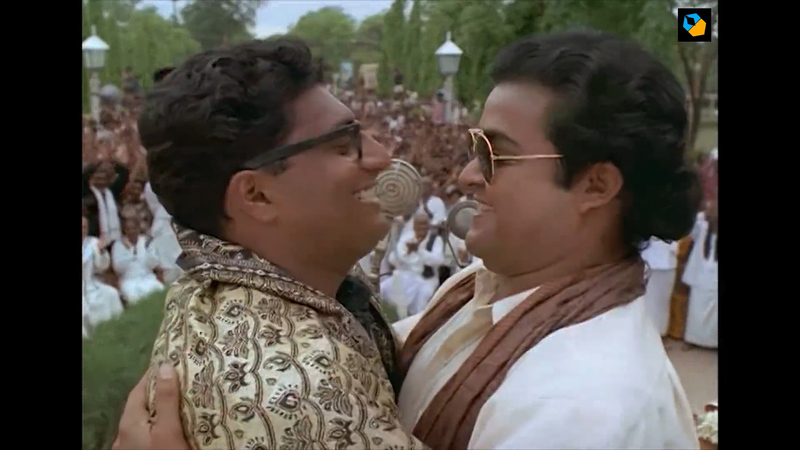 Ultimately Iruvar, is an underrated masterpiece, a work of a true auteur that is virtually and shamefully under seen. 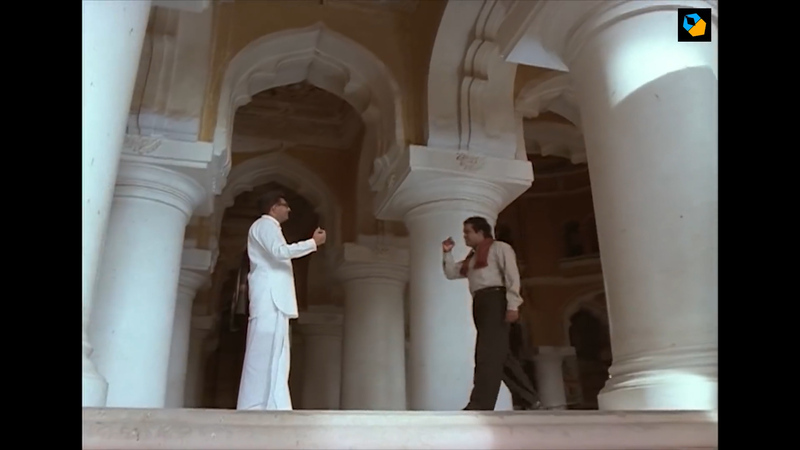 Specifically, I want to discuss Iruvar in regards to its camera movement, framing and blocking. In another blog, we had discussed Spielberg and his use of the L system in camera and actor movement, and how he utilizes it to further engage the audience, develop character, and reveal motivation and intention. 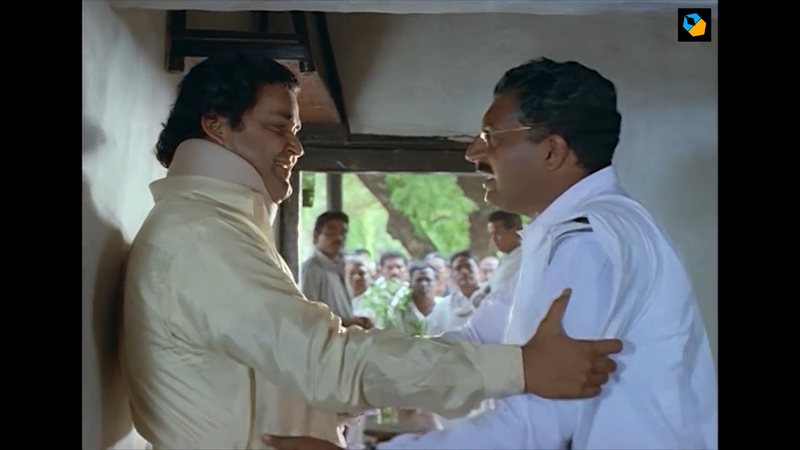 Iruvar follows similarly in this vein, where it uses framing and blacking to showcase the power dynamic between the two main characters as their fortunes shift and reverse. Iruvar, or translated as The Duo’, is a 1997 Indian Tamil epic film directed by Mani Ratnam. It’s about two friends; Anand, a struggling actor from a poor family, and Tamizhselvan an upper class writer with political aspirations. The movie explores their relationship as both become increasingly popular and famous in their native state of Tamil and finally throughout India. However, as one star (Anand) starts to eclipse the other, their relationship becomes fraught and potentially irreparable. At the time of the films release, it unfortunately bombed, in part because of the parallels between the fictionalized characters of Anand and Tamizhselvan and the real life Tamil legends Ramachandran, an iconic and venerated actor turned politician, and Karunanidhi, a prolific writer whose work is still widely known in the Tamil state. While the film did not do well in its home country, it played at various international film festivals while picking up numerous awards. In the era of Trumpism, it’s fascinating to see a different take on celebrities-turned-politicians run amuck. Showcasing the potential corruptible nature of politics and specifically capitalism and how hard it is to escape unchanged. Beyond this, I will discuss director Mani Ratnam’s masterful understanding of blocking in both the position of the camera and actor. This is further heightened by the angles in which he utilizes the camera and the position of actors, as the power balance slowly is shifted throughout the film. This power balance is further shown through the characters positioning in regards to one another, how much they dominant/fill the frame. This use of utilizing low angles to denote positions of power and putting characters on higher standing ground is a hallmark in Orson Welles work and this one of the many parallels between Iruvar and Citizen Kane. Both films have characters who are slowly corrupted as they enter the political arena while their friends watch one. The political rallies of both films have characters perched high above as they look down on their audience. The character of Anand, much like Charles Foster Kane, is shown to be larger than life as the film progresses. Anand slowly takes the power from Tamizhselvan and this is repeatedly shown through the blocking and camera positioning. Again, through blocking and framing in both camera and character, we can showcase character development and motivation clearer and more efficiently than with any line of dialogue.Additionally, Anand’s aspirations and desires are foreshadowed in his first meeting with Tamizhselvan. As he enters an empty throne room set, he slowly sits on the throne, allowing himself to fully bask in the potential power and notoriety he may one day have. He is then interrupted by Tamizhselvan, again introducing the power dynamic and influence at the beginning of the film. At this point in the film, Tamizshelvan is an established writer with far more fame and power to his name than Anand who is scraping by as a film extra.. This is represented a few scenes later. Anand’s first leading role as a hero has been shattered, as the production has run into financial problems. Anand, enters a courtyard lamenting at his lost chance, and that he will never have an opportunity like this again. Tamizhselvan appears from above on a building ledge, looking down, establishing a sort of God like role. He both figuratively and literally talks down to Anand, telling him not to worry and he will have another opportunity. At this point he has the power and the prestige that Anand so desperately craves. Furthermore, it is important to note, at the beginning, Anand is the first to arrive, earlier than any other crew member. This shows us his desire and work ethic, nothing will stop him from reaching the top or the throne. This is contrasted later, when he arrives late to the rallies and demonstrations that Tamizhselvan and the political party are holding. Anand now makes people wait for him as his star is established and the power dynamic is now reversed. 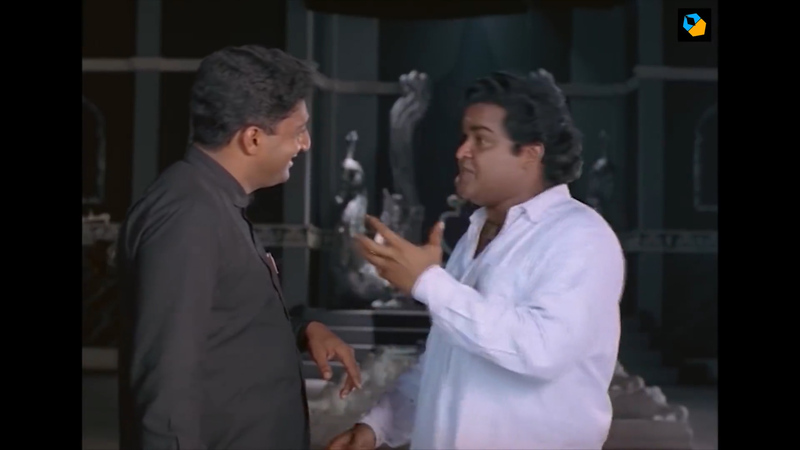 Additionally, Iruvar utilizes colour to explore and deepen the relationship between the two protagonist and the battle of wits they have unfortunately gotten into. 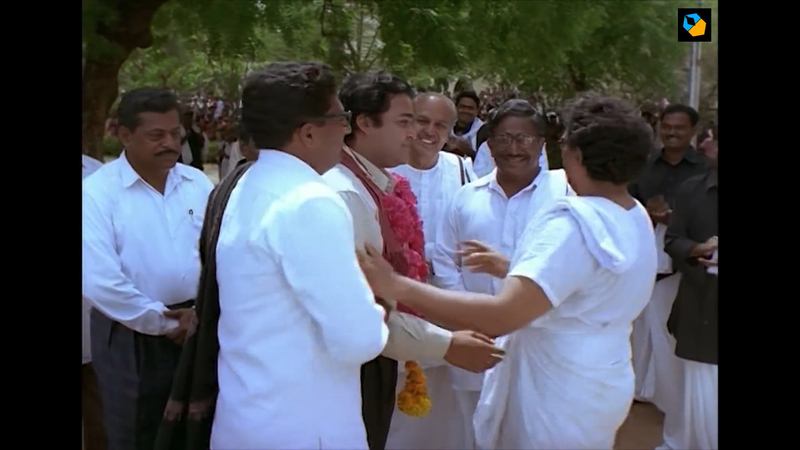 Anand is wearing white when he first meets Tamizhselvan, while he is wearing black. The throne room itself, appears to be black and white as well. It can be viewed mainly as a chess board, as both individuals vie for power as a battle of dominance and wits slowly engulf their friendship as the film progresses. These colours also extend into the political party leaders home, the assembly, or the large hall where the two friends engage in a battle of wits and dominion over one another. Additionally, it is interesting to note, that the film extends the black and white motif to many of the film within a film sequences within the film. The basic answer, is at the time these films would be black and white. However, beyond this, it shows that things are not simplistic, that is not what is simply being shown or represented. There is a multitude of depth and gray area when it comes to the relationships between the characters, their politics, and what they truly desire. The camera also establishes and reinforces the power dynamic as it changes throughout the film. At their introduction both the camera and Anand follow Tamizhselvan, as he has the name recognition and power. Tamizhselvan in this scene consistently guides the movement, as a sort of dance between the two characters. The camera never leads or assumes where the action is going to take place next. It dutifully follows Tamizhselvan as he is the one in power and dictates where everyone should be going next. 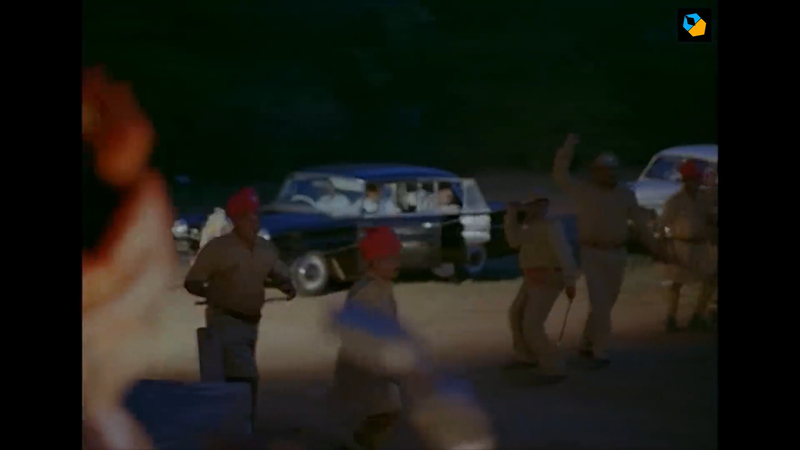 Most importantly, he circles Anand three times throughout the scene. Furthermore, this particular circular movement, is not only vital to this scene, but plays a prominent role throughout the film. 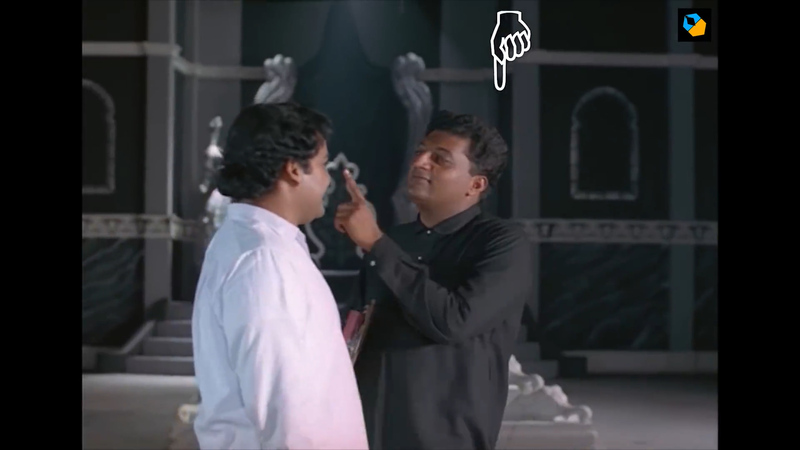 At the end of the same scene in the throne room, the camera shows that Anand is no longer behind Tamizhselvan, they have reached equality, both characters have achieved a respect for one another. Additionally, the film ends every scene with either Anand or Tamizhselvan in an equal position, or one dominating over the other and at times this is very noticeable or deliberate. In the beginning of the film, as mentioned previously, Tamizhselvan is dominant both in stature and camera position. Over the shoulder shots with himself dominate the frame in an almost exaggerated pose as his body fills the camera. When the two of them are on the terrace pontificating, Tamizhselvan is closer to the camera in the foreground, larger than life, as Anand is the background almost diminutive. However, after Anand receives another hero role and his star status starts to ascend, they now have equal weight in front of the camera in both blocking and positioning of the actors and camera. This becomes a delicate dance as director Mani Ratnam is very careful not to establish one character over the other, as they are now on equal footing; as history now has a place for both of them.This is further aided, by the fact whenever they are on equal footing or supportive of one another, they are in a two shot facing each other. When they are in conflict or at ends, they are shown in over the shoulder shots. As the film progresses and Anand finally achieves superstar power, the positioning of both camera and actor shifts once more. Anand eventually repeatedly arrives late, knowing his popularity eclipses everyone else, and steals the attention from Tamizhselvan. However when Tamizhselvan himself arrives late, he is forced to wait, and we are now fully aware who holds the power, and it is a game Tamizhselvan cannot win. 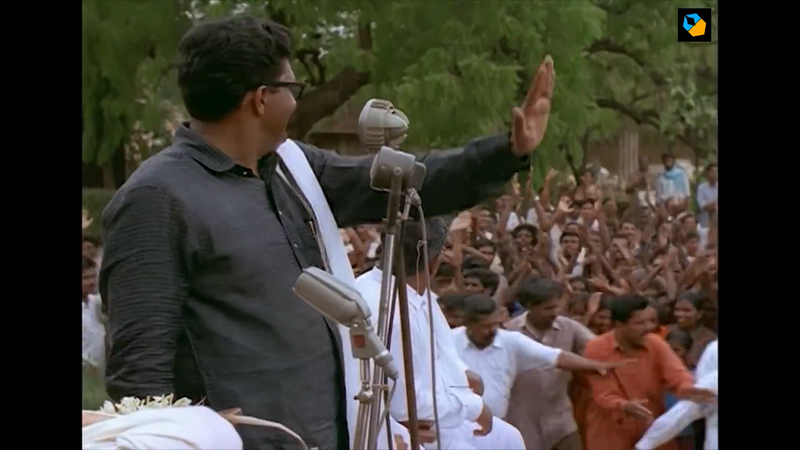 Later, this circular movement is shown again, at the height of Tamizshelvan’s political career, as he is delivering a speech in front of a crowd of supporters. The camera continuously circles him until he is interrupted by Anand’s arrival. The power dynamic has been broken and here we are clearly shown that Anand now has ascended to the top of the political sphere. In a later scene we finally have the camera circle Anand as he delivers a speech on the pulpit, that is presented in one long take. Lastly, Tamizhselvan again circles over to Anand later in the film, when Anand finally becomes a bonafide star. 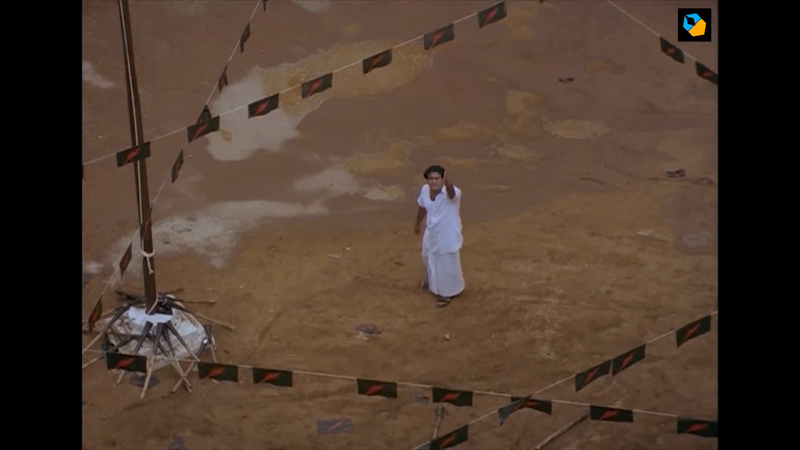 The camera does later in the film, too, as at first follows Tamizhselvan camera right as both him and Anand enter the frame. However, as the scene progresses the camera moves to the centre, showing the both as equals. Then the camera moves up to show a sort of high angle, revealing the crowd behind them. Finally, Tamizhselvan then moves over to Anand’s side, here we are clearly being shown that the power dynamics have been re-established as the board game has been reset. Anand now has the power. This is a remarkable understanding of blocking and movement from an unheralded master of cinema. Finally, in the last shot, we are presented with another circular take as the camera moves around Tamizhselvan delivering a tearful monologue about his friend. He has power once more, but what use is it now? This circular movement is only showcased once more outside the relation of Anand and Tamizhselvan. As the camera circles Kalpana and Anand, she accuses him of only caring for himself and power and has no respect for anyone else. Anand clearly has moved far from his humble working class beginnings. In the first act he playfully accused of Tamizhselvan of being just a mouthpiece from an upper middle class family who has no understanding of true work and starting from the bottom. Anand is now here, and has completely forgotten where he has come from. The circle of power will continue on end, as a form of feedback loop; a game which cannot be escaped. Another remarkable sequence and probably my favourite scene in the film, not because of its blocking and camera movement, but rather its formalist deconstruction of a film inside of a film, which involves Anand and his leading lady Ramani. At this point, the both of them have appeared in a film together and are firmly established to have a solid working relationship, with barely a single inclination towards anything beyond that. Ramani is practicing a complicated song and dance number in their latest film, with a series of background dancers and extras. This sequence then develops beautifully as we strip away the veneer and gloss of Bollywood. We bear witness to the hours spent toiling to perfect each cue and step. The subtle glances between her and Anand, indicate the development of something beyond a working relationship, as they grow closer and closer . Ultimately, the scene takes a darker turn as her lecherous power hungry agent who happens to be her uncle physically abuses her, warning her not to fall in love with Anand. This entire set piece, ironically plays against the happy and cheerful musical number with the film. A remarkable sequence that shows the thin line between the movie industry and politics. An arena of corruption, that people will endlessly via for power, as anyone who enters will ultimately become corrupt. Furthermore it shows us the complexity of politics, that not everything is what it seems on the surface, they can say one thing but mean another. This entire scene is a fascinating and phenomenal sequence that shows an auteur at the height of his artistic peak. Despite its status as one of the world’s largest film industry, Bollywood is unfairly maligned by many film fans. While the rest of the world may view India as a monolithic culture, Bollywood is made of multiple ethnic groups throughout India. From Tamil, to Punjabi or Telugu. Each unique group provides an idiosyncratic view of the world that is unparalleled and singular. If the rest of the world can look past the stereotypes that are firmly rooted in a sense of ignorance of Bollywood they could find fascinating and absorbing works of art that transcend borders. Iruvar is one of these films. As stated previously, at the time of its release, the movie was a point of contention, to the point of protests and demonstration as people felt it discredited and insulted the real life counterparts. However, now that is removed from it just released status, it is to me of the most fascinating films of Indian history. While it does seem to homage previous filmmakers, it presents its own worldview, that at times is indebted to no one and has something truly profound to say. If you want to see a film that in 2018 that is startling true to life and tragic, I wholeheartedly recommend Iruvar. 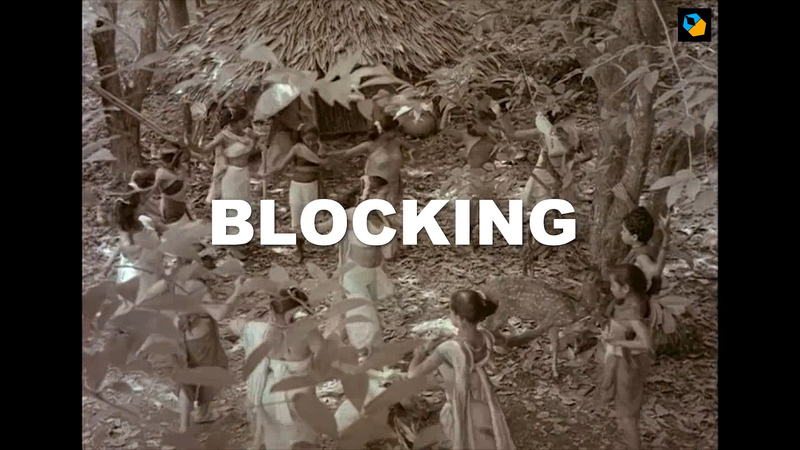 Lastly, again it is a film that can show how camera and character movement and blocking can be transcendental and develop characters and themes unlike any other technique.